Microsoft's Nokia division has revealed its latest mobile phone – but rather than the sort of high-end flagship number that's designed to take on Apple, it's taking aim squarely at the bottom of the market. It's no less than a plastic mini-mobe that will sell for no more than €19 ($25) before taxes and subsidies. Billed in the company's marketing materials as "an ultra-affordable mobile phone with music and video player," the Nokia 130 targets the kind of pre-iPod media consumers that have all but vanished from developed markets with the advent of smartphones. And make no mistake; smart, this phone ain't. Notice that its name lacks the Lumia branding that Nokia has been hanging on all of its Windows Phone handsets so far. That's because it doesn't run Windows Phone. In fact, it doesn't even run Android, like the ill-fated Nokia X. No, dig through this device's specs and you'll find that the Nokia 130 is nothing other than an old-fashioned dumbphone, based on an operating system described as "Nokia OS Series 30+." It doesn't do mobile data at all. It supports only 2G GSM on the 900MHz and 1800MHz bands, although it is available in an optional dual-SIM version. That said, it claims a maximum talk time of 13 hours and a standby time of up to 36 days with one SIM or 26 days with two. It also includes a built-in FM radio. The Nokia 130 is small, it makes calls, it plays media, and it comes in three colors. And that's about it. For media playback, customers must supply their own microSD cards up to 32GB. 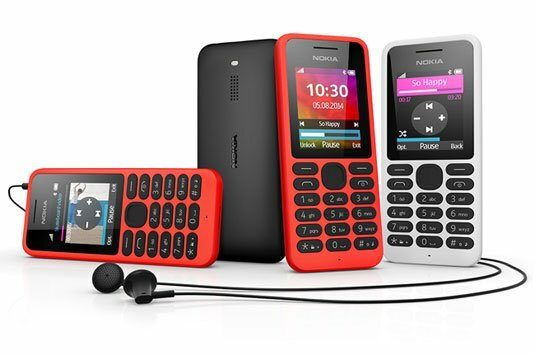 Nokia claims the device can play back music for up to 46 hours and video for up to 16 hours on a single charge – but given that the Nokia 130 only has a 1.8-inch screen with 160-by-128 QQVGA resolution and no ports for hooking up external displays, it's doubtful most owners will be watching much video. Arguably, Microsoft hasn't marketed a music player this dumbed-down since the original Zune. But in this case, it's clearly that sub-€20 price point that's meant to attract customers, not the device's features. Nokia has remained a strong contender in the low-end phone market even as its fortunes failed in the smartphone wars, and it would be unwise for Microsoft to give up those sales when other areas of its hardware business are still a drain on its bottom line.